Three months after quietly filing to become a public company, Spotify finally made its debut on the New York Stock Exchange Tuesday. It was a big day for the Swedish music-streaming giant, to say the least, and it ended up exceeding expectations from Wall Street analysts on its first day of trading. But for many investors, Spotify may not be the safest bet. In its IPO filing, it disclosed that it has incurred significant operating losses over the past few years, warning investors that it may be a while before it's able to generate profits on a sustained basis. Spotify said that, from 2015 to 2017, its operating losses were $290 million, $430 million and $466 million, respectively. That's something the company attributes to the cost of licensing content and having to pay royalties to music labels, publishers and other copyright owners (like songwriters). That said, Spotify did report growing revenues of $2.37 billion in 2015, $3.6 billion in 2016 and $4.99 billion in 2017, which shows there's potential -- even if it could take some time to turn a profit. Listed under the ticker SPOT, Spotify opened at $165.90, with 5.6 million shares exchanged in its first trade. That brought its total valuation to just shy of $30 billion, about $7 billion more than financial analysts and experts originally expected. And although Spotify's opening day on the NYSE ended with sells of $149.01 per share, that was still 13 percent above its initial reference price of $132. 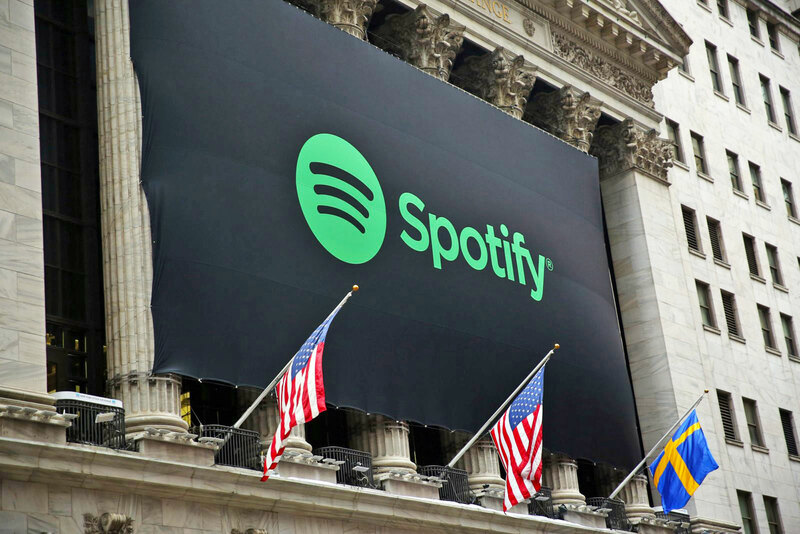 Spotify stock trades under "SPOT" on the New York Stock Exchange. The bright side for Spotify is that it's the largest music-streaming service, with 157 million monthly active users, of which 71 million are paid subscribers. Most important, Spotify said that Premium users are growing at a rate of 46 percent year-over-year, in addition to 29 percent year-over-year for monthly active users. Apple Music, by comparison, has 36 million paid listeners, while Amazon Music vaguely claims to have "tens of millions." The challenge for Spotify will be to keep building a lead over its competitors by bringing in new users and turning existing ones into paid subscribers. To do this, Spotify's strategy is pretty much the same as every other tech company's: keep investing artificial intelligence and machine learning to make its service smarter and more personalized. The company has shown some of the fruits of that research, with features like Discover Weekly, which was introduced in 2015 and recommends new music based on your listening habits. People love the feature so much that Pandora, a streaming service that's also publicly traded, decided to launch its own version. Naturally, Spotify's ability to lure in (and keep) users will depend heavily on the content it offers. Right now, it says there are 3 million artists and creators on its platform, with more than 35 million tracks available to users. While one of Spotify's main focuses will be to continue bringing new artists to its app, it also needs to ensure that it doesn't get shunned by established ones. Taylor Swift, for example, pulled her entire catalog from Spotify back in 2014, though she returned to the platform last week with an exclusive video of her new single, "Delicate." Down the road, the company will need to ensure that it can avoid celebrity feuds, and foster relationships to gain access to more exclusive content. That can give it a major advantage over rival streaming services. The company says it has a great relationship with people in the industry, noting that it has paid more than $9.86 billion in royalties to artists, music labels and publishers since it launched in 2008. Spotify has been looking to get into podcasts and video as well, two areas that are key to its strategy. In its IPO filing, the company said that even though it's an audio-first platform, it will look to include more non-music content in the future, such as "spoken word and short-form interstitial video." We've seen Spotify experiment with things like, most recently, using video loops as artwork for songs, and earlier this year it revamped its podcasts to include more photos and video from BuzzFeed and other media outlets. You can expect to see more of this type of content in the future. In addition to new features, Spotify says it's equally important to launch in new markets. At the moment, the service is available in 65 countries, but it hopes to increase that number in the coming years -- though it doesn't specify by how much. The company said that before launching in a new market, however, it first needs to optimize the Spotify experience for local music preferences, obtain the necessary rights and hire curators who are familiar with the scene. Spotify's co-founder and CEO, Daniel Ek. "Sometimes we succeed, sometimes we stumble," Daniel Ek, Spotify's co-founder and CEO, said in a blog post. "The constant is that we believe we are still early in our journey and we have room to learn and grow." Ek added that going public shouldn't change Spotify's mission: "To unlock the potential of human creativity by giving a million creative artists the opportunity to live off their art and billions of fans the opportunity to enjoy and be inspired by it." But that's easier said than done, as there may come a time when Spotify has to make decisions that appease its shareholders, not its users. That's the risk every company takes when going public. Ek knows this, though. And he said he has no doubt there will be ups and downs as Spotify takes on this new phase and that it looks to "continue to innovate and establish new capabilities" going forward. "Nothing ever happens in a straight line, the past ten years have certainly taught me that," he said. "My job is to ensure that we keep our foot on the pedal during the ups, so that we don't become complacent, and that we continue to stay the course with a firm grip on the wheel during the downs." Spotify's road to prove that it can run a sustainable business won't be easy, especially as tech giants like Apple, Amazon and Google take more serious steps to compete with it. But the company has proven since it launched a decade ago that it can keep users happy, continue to grow at a rapid pace and spread its presence worldwide. So, while it can't assure investors that it will make them money anytime soon, its future is far from bleak.